Whether you’re a Colorado native and you’ve enjoyed our great state for years or you’re a transplant who is searching for the best apartments in Littleton, we think you’ll find plenty to love about Summit Riverside Apartments. Each one of our luxury apartments is designed to make you feel at home in your space. It’s where you go to rest and relax at the end of a long day, after all! But what about when you want to get out and explore the area? There are plenty of wonderful experiences to be had here in Littleton, or if you want a dose of city life, Denver is right around the corner. Our focus in today’s blog, however, is on food in Littleton. 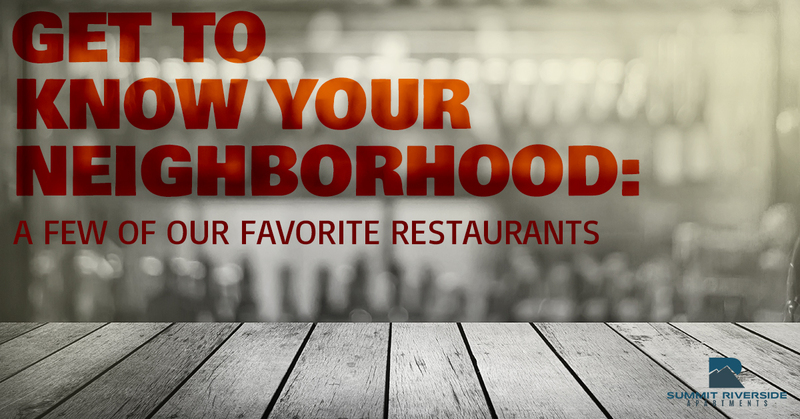 That’s why we’ll be rounding up a few of our favorite restaurants to try right here in our neck of the woods. If you’re new to the area, you’re sure to find something to love on our list! With a focus on food that is “creative, thoughtful, [and] familiar,” the menu at Cafe Terracotta is sure to put a smile on your face. Fans of breakfast will be pleased by the Terracotta Country Breakfast which contains chicken fried chicken topped with pork sausage gravy, two of your favorite style of eggs, and a choice of potatoes. If that’s not quite your style, the omelettes, french toast, or eggs benedicts ought to be. Perhaps you’re not in the mood for breakfast; in that case, you can enjoy a burger, a salad, or a sandwich, or if you visit for dinner, you can treat yourself to crab cakes, walleye, scallops, short ribs, and more. Top it all off with something from their vast selection of wines, cocktails, and beers. According to their website, “The Farm House at Breckenridge Brewery is a Colorado destination for handcrafted food and beer” where you can “enjoy a leisurely meal in the rustic dining room or on the cozy back porch looking out to the Rocky Mountains.” It doesn’t get much better than that! Their menu changes from time to time, but you can always expect a great selection of appetizers, soups, salads, and entrees as well as some truly amazing desserts. Be sure to grab a local brew while you’re visiting! The Melting Pot is one restaurant that’s not to be missed. Their website notes that it has been voted one of Colorado’s most romantic restaurants and that it “offers a truly unique dining experience created by the art of fondue.” The ideal restaurant to try for a number of different special occasions, The Melting Pot is well-loved by Littleton residents. There are a number of different menus to take a look at, but regardless of what you choose, you can expect a unique experience and a truly unforgettable meal. End your meal on a high note with one of their dessert fondues like “The Original” which includes milk chocolate and crunchy peanut butter or “The Flaming Turtle” which features milk chocolate melted with caramel and candied pecans. Treat yourself to a create-your-own dessert fondue to give your own creation a try. Looking for a place to head for your next breakfast, brunch, or lunch event? Toast is open from 6:30 am to 3:00 pm and offers an awesome selection of foods that will have your mouth watering. Whether it’s one of their benedicts, the avocado toast, honey fried chicken and pancakes, sausage and eggs, breakfast poutine, omelets, or a banana walnut french toast, you’re sure to find plenty to love on the menu at Toasts. If you prefer something a little different, they offer sandwiches such as the Monte Cristo, Reuben, Turkey Pedro, and Toast Club as well as a selection of soups and salads to choose from. Every city should have at least one great pizza place and McKinners is one of the best options in Littleton. Between the awesome happy hour specials and the variety of the menu, McKinners Pizza Bar is a winner. Their original pizzas include favorites such as the Oystermiller (topped with smoked oysters, sausage, and mozzarella), the Chickenzollarella (garlic ricotta sauce, basil chicken sausage, mozzarella and gorgonzola, and basil), and the Extreme Johnzza (pepperoni, sausage, onion, green pepper, black olive, mushroom, and mozzarella). In short, there’s something for everyone. A rotating special cheesecake, a delicious brownie, and a dessert called Tubbies Nummies that simply has to be tried are not to be missed. At Summit Riverside, we strive to be the best apartments for rent in Littleton because we have so much to live up to. With restaurants like the ones above making our city a better place, we want to offer luxury apartments that live up to the great reputation our city has. With a selection of 1-bedroom apartments, 2-bedroom apartments, loft apartments, and more, you’re sure to find something that works well for your situation. Take a look at the apartment floor plans we offer, go on the photo tour, check out the amenities available for the community, the units, and your pets, and finally, schedule a visit today to see for yourself what Summit Riverside Apartments in Littleton have to offer. We think you’ll be pleased with what you see and we look forward to seeing you!